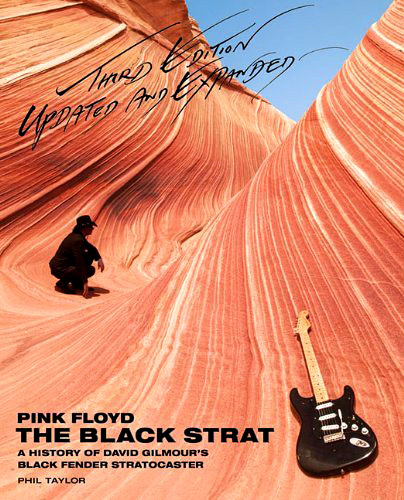 Earlier this month David’s long-time technician Phil Taylor, released the third edition of his The Black Strat – A History of David Gilmour’s Black Fender Stratocaster book. Expanded into over 200 pages and lots of new photos the book promises to be an even greater document of David’s legendary guitar. It’s easy to joint the choir and shout “milking the cow” but then again, we rush out to get the latest copy. I’ve been a Kiss fan since I started to walk and know all about being fooled. We complain knowing that the package is already on its way. This latest edition has, as promised, lots of new pictures. Even some that I’ve never seen like a handful from the Obscured By Clouds sessions (with a Colorsound Power Boost lying on the floor! ), a nice shot of David’s guitars used on The Wall tour and a couple of new close ups of the current version of the Black Strat. Still, most of the 50 or so new pages are mostly bigger spreads from the previous editions and some odd “The Black Strat was featured in this months Guitar World” notes. The last few pages covers the latest appearances with the Black Strat (Barn Jam, Jeff Beck, Crisis etc) and the NOS (Ron Geesin/Atom Heart Mother, Bryan Ferry etc). There’s also a couple of very cool surprises like pictures from the No More Lonely Nights sessions with Paul McCartney in 1984. I did an analysis of this about a year ago but I see now that I was way out! To my defense though very little was documented until nowâ€¦ Seeing this I can’t help to think that Phil must have seen the post and thought “I’ll show themâ€¦”! Another surprise is the documentation of the blue Eric Clapton signature Strat that David used for a brief period in 1990 (although he fails to mention the newly emerged footage from the Paul Young sessions). Phil has also finally managed to fix some errors and stuff that was left out in the previous editions like the 5-way switch that was installed in the Black Strat in 1985 and the swapping of ’57 maple necks between the 2003 DSOTM BBC documentary, 2003/04 Interstellar Exhibition and Live 8 in 2005. I can’t help but wonder though when the ultimate edition will be released. I’m sure we haven’t seen the last edition yet but more updates without any direction or though of whether this is a book about the Black Strat or David’s gear in general will end up being just a messy encyclopedia with too many holes. Each update feature more guitars without any real facts and I’m a bit surprised to see the inclusion of the 1954 #0001 Strat without even a single detail of its origins (see my feature here). Why are the blonde and brown Teles from David’s first years with Floyd included without any reference to the more well known ’55 Esquire or the sunburst ’59 Telecaster (Animals/Dogs)? Why is the Clapton Strat mentioned and not any of the Gibson Goldtops or the Gretsch Duo Jet? The Black Strat book is obviously written with us die-hard nerds in mind and although one could argue that the first edition should have been as complete as this I must say I really enjoyed reading this one. But next time Phil, bring out the guns. Sweep the archives, force the last details out of David and dust off the old pedal boards. Although it puts me out of business we want to see everything down to the tiniest screw! Order your copy from Amazon and visit the official The Black Strat site for scans and details. Hey Bjorn, Did Phil Taylor write in the book where the first ’57 Strat Neck came from (the one used on the Classic Albums DVD) and waht shape it is? I’m Just curious. I’m happy that you carry on your website constantly and some sites report your adress (gilmourish.com) for reference, this says to me that your site is one of the most important about PF on the web. I got the 3nd edition for christmas, beautiful pics really !!!!!!!! There are always some informations missing, very little but interesting things, we can pick some of them from articles here and there. I wonder why he does not say where the original MAPLE CAP (!!!) neck ended (we all know that it should be on David’s brother’s Telecaster), why he doesn’t put a pic of this neck as it is today ???? Where did David get all the electronics ? Were they all taken from the Black Strat and the Sunburst ? Phil says there is the rosewood neck from the Sunburst strat but the picture shows (to me) two big headstocks which the first is from the natural strat and the second is the maple cap neck. He doesn’t show the original pickguard assembly with the humbucker mounted on it. He doesn’t show what’s left of the poor 1971 bullet Stratocaster ! When he went back to the black strat with the RW neck, the close-ups from the Brighton footage don’t show a hole into the pickguard, do you know something about that ? You wondered why Phil doesn’t mention the ’59 Tele and the Les Pauls. The reason I think is that he talks about the first tele and some other guitars that belong to the journey of the use of the black strat so that there are no gaps which makes sense. Otherwhise it would be a guide to all of David’s main guitars. It’s sad but it the possible truth. I’VE FOUND A PICTURE FROM DAVID’S 50TH BIRTHDAY PARTY IN 1996 WHERE HE PLAYS A FENDER STRAT PLUS, I’LL EMAIL IT TO YOU (maybe you have it already!!) . I know that I’m annoying but I’m a big fan of both David and many Fender instruments so I try to learn as much as possible of the relationship between the two. Bjorn been wondering, do you use the other pickup positions on the strat at all? other than Bridge, middle and neck? I’ve been using them for a while with my CS 54 set, its weird its like i can’t find the right place to use them with my band. I agree with the above that the ultimate book would be David’s effects and boards over the years with lots of pictures and diagrams as to the set up. Would it give away too much? David can rest as the king of tone even with all his secrets revealed. Just had to say I saw Roger Waters’ The Wall a few days ago and was absolutely astounded!! True it lacks David’s soulful tone and harmony sometimes but the message and presentation was jaw dropping to say the least. Both those guys are Pink Floyd and, of course, are best working together but Roger sure can pull off one mind blowing performance-don’t miss it if you can!!!!!! Might have to check this one out. $20.00 for a large paperback isn’t too bad, and it’s probably one hell of a book. I do agree, though, that it should either be about the Black Strat only, or about all of Mr. Gilmour’s gear over the years in general; not a vague in-between. I want a book like this on Andy Summers, too. His tone is probably my second-favorite. I only hope it corrects the many inaccuracies and misinformation that the first edition had. How can we be sure? ok maybe i went a little overboard .my point is,if i was going to put out a book on a guitar that your boss uses, i would get every detail i could before i put the book out, there is so much potential for this book,all the different guitars,fuzz faces etc.being a guitar tech why does he put tips in it. updates based on our feedback,tells me he did not do his research first. i cant believe that between taylor and gilmour that they could not get all the details down the first time. if it was an end all book on daves gear,i would spend 100.00 for the book. I’ve got 2 books now, the second hardback edition and the third expanded in paperback, and i’m in two minds about it. I love all the extra bits in the new one but agree why it took 3 books to get to it. I think in response to why there were no mention about Gibsons is cos it’s a Strat book about one strat and it’s alternatives. I think the gibsons weren’t alternatives to the the black strat cos they were use in conjunction with the black strat (as are the gretsch, taylor and acoustics). and as to reviewing equipment and effects well it’s not about the amps and effects just the guitar. The only worrying thing is at the end of the third book it stated “to be continued…”. Is that the history of the Black strat or further expantions of the book. Time will tell. I agree with you Bjorn, I was a quite disappointed when I got the book (the second edition, I believe) I was expecting it to be a bit more technical and less historical. Frankly I am not expecting much more from the new release and don’t think I’ll buy it. I have learnt so much more about Gilmour’s music right here on this great site. This is truly one the best Pink Floyd resources that has ever existed. I really mean it. i think mr taylor took a page from gilmours book,how to bleed fans for every dime and give as little as possible.its not like gilmour is dead,why can’t mr taylor get it right the first time,its almost like gilmour releasing more barrett stuff that has been out there for years instead of anything new. (reaction in g,scream thy last scream,one in a million etc)how many times can you release arnold lane,matilda mother.or 2 live dvd’s of almost the same stuff. “The Pink Floyd Gear Enciclopedia” would be great! I got the first edition. It’s good but could have been a lot better – it could have been much more detailed. I havn’t bought the second edition and won’t be buying the third. I agree that it would be great if there were a detailed description of gear used throughout DG’s career. Bjorn – maybe you should consider writing it ? I’d definitely buy it. Maybe Phil will do an entire Pink Floyd gear book. With Roger’s basses, Rick’s pianos, and organs, Nick’s drums, and Syd’s gear. Maybe Snowy White’s too. I agree with a lot of what you are saying Bjorn, it is aimed at nerds so give us a definative edition to really satisfy our lust! Ordered mine from Amazon and it still hasn’t arrived getting impatient now!! Oh man, do I want this book. I was thinking perhaps the lack of mention of the Goldtop Les Pauls would be because they’re Gibsons and the book is more focused on Fenders. But that’s just my theory. I don’t see how Phil Taylor could’ve just forgotten about them, so perhaps he left them out so as not to stray from the original topic: The Black Strat. I also had no idea David ever owned a Clapton Strat. That’s very interesting. And I wonder if they got Gerry Scarfe to contribute his hand in writing the “Updated and Expanded” bit on the book. It certainly looks like his handwriting. How lucky you are! I ordered mine two months ago at amazon.fr. And it will definitively be mine next december. So, about the third edition of the book, I’m waiting for my order too but like you, I’m a little bit sad about this. I was waiting for some accurates informations about amps (Hiwatts / Fenders / Selmers / Alessandro / cabs / combos etc…) effects (PCM70 / TC2290 / etc…) or details about what stompbox used on what songs. (In facts, every thing you write on gilmourish but with photos and comments from Phil) . It’s a little bit strange to have this book, dedicated to maniacs like us, without theses precious details. For example, I read somewhere that David used a steinberger into a small Gallien Kruger combo for the ending solo on Sorrow. Hey Bjorn, i’ve read this same book. It’s a pretty nice too have for David’s strat history and for the photos. Nice work on the review, Bjorn. Thank you Bjorn. I have a question. Does this 3rd Edtion show the ’61 Telecaster with a Charvel neck used during The Wall Tour? I think that I have never seen it.